This post is regarding Valve recently introducing a new version of Steam Play. Previously I’ve heard Wine (Steam Play uses a modified distribution of Wine, called Proton) users having some luck running Gun Bombers. Now an active player (thanks Miikka!) told me that Gun Bombers works very well indeed through the new Steam Play. As a developer this is great news because typically a separate Linux version would have to be tested and compiled in order for the game to be played on Linux. I’m interested to hear from others too that have tried Gun Bombers on Linux and/or the new Steam Play and how your experience was. That’s right, Gun Bombers one point zero is finally out! Check out the release trailer below. I’ve been meaning to write this for a while after seeing a few people struggle to host a game. This quick guide should make it relatively straightforward to do so. Why the need to port forward? I think it’s important to first note why we need to do this. You’ve probably hosted many other games without needing to do port forwarding so why now? The reason is that these games typically have centralised servers that you are connected to at all times. These servers help to automate some tasks such as port forwarding. Gun Bombers on the other hand doesn’t have hosting servers. You are the host and others join your game. As a security measure you need to tell your network that it’s okay for these people to connect and send packets to you. I should note that these instructions probably apply to about 95% of you. Some are lucky not having to port forward at all and some might not have the possibility to do so. You need to know your local IP and the port that the game uses. Luckily both of these can be found when you host a game, see below. If you need to change the port this can be done from the settings page found on the main menu. There is also a Test button to see if you’re ready to host. If it says that the port is not open then you need to continue with the next steps. You need to tell your router to port forward i.e. send packets that arrive to the specific port to your computer. Typically the address to your router is https://192.168.0.1 or https://192.168.1.1. The default login is also typically u: admin and p: admin but if not you may need to Google and seek your router manual. This is probably the most time-consuming part – You need to locate the port forwarding page on your router. You’re faced with many menus and the location and names are not universal. 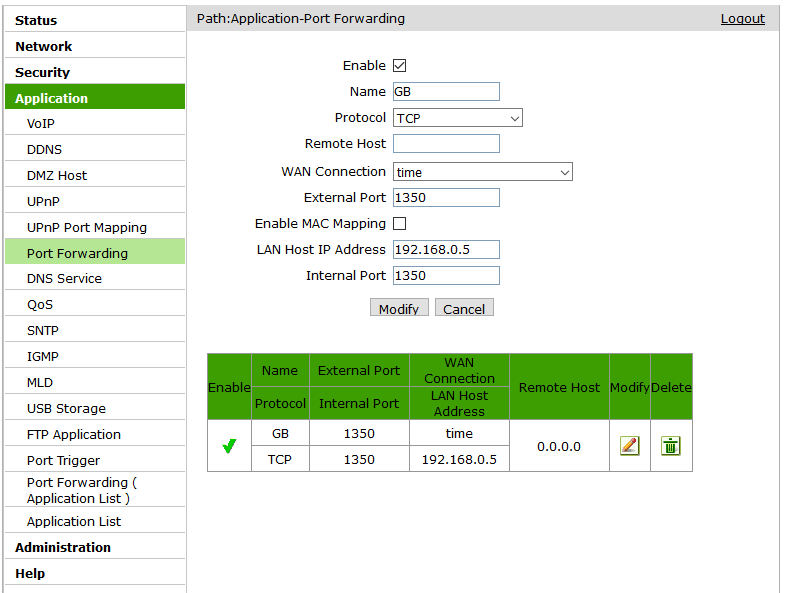 When you do find the appropriate page enter the port and ip details you gathered on Step 1. Below is an example of my router page. If you did everything correctly running the Test button mentioned on Step 1 should come up with a message saying the port is open. Now you’re ready to invite your friends to your game! Well, we finally made it. Shortly after writing this Gun Bombers will be available on Steam as an Early Access title. It’s been a long 2 years up to this point of which you can better understand from this gallery. This is not the end though. With the help of fans like you we can make Gun Bombers even better and that is the reason it is on Early Access in the first place. We’ve also set up a community hub in Discord if you want to come and hang around with us and find people to play with. Yes indeed, Gun Bombers was Greenlit last night! Thanks to everyone who contributed. I’ll be now working on getting the game ready for Early Access. Gun Bombers is now on Steam Greenlight. Your vote is much appreciated! The third Alpha version is now available to everyone for free. Head over to the Download page to grab a copy. The second Alpha version is now available to everyone for free. Head over to the Download page to grab a copy.